The Turkish government’s recent defense of the Hamas terror organization and criticism of Israel over the Jewish state’s use of force to repel infiltration attempts by rioters on the Israel-Gaza border has prompted calls by Israeli lawmakers to cut ties with Turkey, less than two years after diplomatic relations were restored. Speaking with Channel 10, Likud MK and former coalition chairman David Bitan compared Turkey’s president to the Tehran regime, and urged the government to cut ties with Turkey. “This is a person who, in terms of his hatred [for Israel], is no less than Iran,” said Bitan. Turkish President Recep Tayyip Erdogan, Bitan argued, has adopted a hostile posture towards Israel as a way of building support within the Muslim world. Turkey, which once boasted strong ties with Israel, was the first Muslim state to recognize Israeli independence. Since the ascension of Erdogan, first to the premiership and then the presidency, however, relations between Israel and Turkey have deteriorated, reaching their nadir in 2010, when a Turkish ship, the Mavi Marmara, attempted to run an Israeli security blockade of the Hamas-ruled Gaza Strip. Israeli security personnel who boarded the ship were assaulted by Turkish nationals, forcing the Israeli unit to open fire, killing 10. Turkey cut diplomatic ties with Israel over the incident, resuming them only six years later, after Israel agreed to apologize for the incident and pay compensation. Despite the 2016 agreement, relations between the two countries have remained tense, due in part to Turkish President Recep Erdogan’s criticism of Israeli policies and opposition to President Trump’s decision to relocate the US embassy to Jerusalem. Turkey has also served as a haven for Hamas terrorists living in exile. Earlier this year, Israel’s Shin Bet internal security agency revealed a group Hamas terrorists living in Turkey were still active on behalf of the terror group, raising funds and organizing cells for attacks in Israel. Last week, Turkey expelled Israel’s ambassador and consul-general, humiliating Israeli Ambassador to Turkey Eitan Naeh during his departure. Tensions between Ankara and Jerusalem escalated following the opening of the US embassy in Jerusalem – a move Turkey’s government strongly opposed. Turkey also excoriated Israel over its use of force to prevent rioters from infiltrating into Israeli territory. 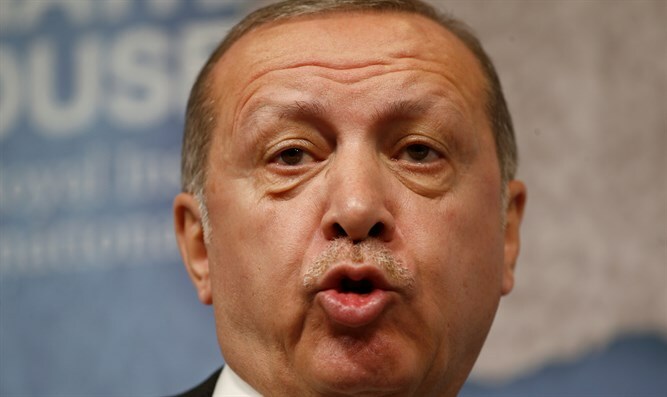 Following the Hamas-instigated riots on the Israeli border with Gaza last week, Erdogan, denied last week that Hamas is a terrorist organization, calling the terror group a “resistance movement”. “Reminder to Netanyahu: Hamas is not a terrorist organization and Palestinians are not terrorists. It is a resistance movement that defends the Palestinian homeland against an occupying power. Erdogan also accused Prime Minister Binyamin Netanyahu of having blood on his hands. "Netanyahu is the PM of an apartheid state that has occupied a defenseless people's lands for 60+ yrs in violation of UN resolutions. He has the blood of Palestinians on his hands and can't cover up crimes by attacking Turkey," Erdogan tweeted.